The International Travel Company Oxalis, which is organizing tours to the world's largest cave Son Doong in Quang Binh Province, said that more than 400 international tourists have booked for tours in 2014 at US$3,000 per head. For ensuring comfort and safety in the tours, the Travel Company has organized the tours well to provide both comfort and safety, particularly along the path that tourists will take on the tour. The organizers have set up health facilities to check that no one suffers from undue high blood pressure and other health conditions. "Therefore over 1.000 foreign tourists had been refused to make a Son Doong tour due to health reason", added Oxalis Travel Agency. Son Doong cave is the world's largest cave, located in Quang Binh province, Vietnam. 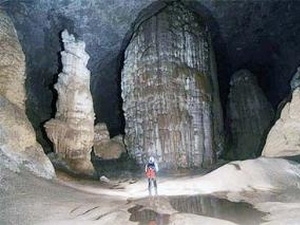 The name "Son Doong" cave means "mountain river cave". Overseas arrivals to HCM City reached 2.8 million in the first nine months of the year, up 3 per cent from the same period in 2012. According to the municipal Department of Culture, Sports and Tourism, the number of foreign visitors to the city in the period fulfilled 68 per cent of its 4.1 million yearly target. The city's tourism revenue for the first nine months reached an estimated VND63 trillion (US$3 billion), a year-on-year increase of 20 per cent and 77 per cent of this year's target. The encouraging figures were attributed to the city's tourism stimulus programme, which started in early April. Sale promotion months due to be held from September to December 2013 are also predicted to have a positive effect. .
Sixty-four city-based enterprises have registered and pledged to take part in a tourism stimulation programme launched by HCM City's Tourism Administration. These enterprises include 22 travel companies and 25 hotels and resorts, tourist areas, museums, shopping and eating areas.The programme was first included on the website www.timelesscharm.vn . Vietnam Airlines will add four weekly flights on the HCM City-Incheon route and five weekly flights on the Ha Noi-Pusan route starting from October 28. The move aims to meet the increasing demand for travel of local visitors. With the new flights, there are now a total of 11 flights a week on the HCM City – Incheon route and 12 flights a week on the Ha Noi-Pusan route. Hanoi and HCM City are among the most attractive Southeast Asian cities and have become ideal destinations for young people from the UK. Other cities such as Cambodia’s Phnom Penh and Siem Reap, Thailand’s Bangkok, Chiang Mai and Pattaya are attractive to them thanks to low-cost services. In a survey on the price of hotel rooms over the world in the first six months of the year, the Hotels.com website noted that a five-night stay in Phnom Penh was at the same cost of a one-night stay in Rio de Janeiro (Brazil). The average hotel room price in Phnom Penh was around 35 GBP for one day and night compared to 180 GPB and 137 GPB in Sydney (Australia). Hanoi was placed second in the list (41 GPB), followed by Chiang Mai (44 GPB), Siem Reap (45 GPB) and HCM City (60 GPB). The hotel room price in the Asian region dropped by 2 percent. Another survey last month by ABTA - UK’s leading travel association, identified Thailand as the most favorite destination for British youth followed by Australia, the US and South Africa. Around 24,000 young students graduating their high schools are expected to travel abroad. Vietnam Airlines and VietJetAir last Friday resumed services to Phu Bai Airport in Thua Thien-Hue Province after the airport had been closed for six months for runway repair and other facility upgrades. On the first day of flight resumption, Vietnam Airlines had five flights to the former imperial capital of Hue from HCMC and Hanoi, and VietJetAir had two from HCMC. Phu Bai Airport’s reopening was two months ahead of schedule. After the upgrade, the terminal of Phu Bai Airport has three more gates and can handle larger aircraft like Boeing 737 and Airbus A321 with dozens of flights a day. During the airport closure, prices of tours to Hue increased as travel firms had to cover additional costs of transport from Danang to Hue. The Department of Culture, Sports and Tourism of Thua Thien-Hue Province has previously offered a travel stimulus program lasting until Wednesday with several direct discounts for tourists such as room rate reductions, free services, promotional entry tickets to historical monuments and free traditional musical performances. The number of tourists visiting Hue in January-July rose by 3% year-on-year to over one million with those coming from other countries accounting for around 400,000. * Vietnam Airlines has said it will begin adding four weekly flights on the HCMC-Incheon run and five weekly flights on the Hanoi-Pusan service from October 28. The HCMC-Incheon route will have a total of 11 services a week from the current seven while Hanoi-Pusan weekly flights will number 12 from the present seven. These extra services are to meet rising travel demand of local visitors, especially in the fall in Korea. Vietnam Airlines now is the only local air carrier operating direct flights between Vietnam and South Korea’s Seoul and Pusan. Besides increasing flight frequencies, Vietnam Airlines offers a discount of up to 29% for customers purchasing tickets at least two weeks before departure on the HCMC-Seoul route with the price starting from US$320 a person, equivalent to VND6.81 million. The national carrier also offers a discount of 22% for customers buying tickets at least seven days before departure at the starting price of US$350 a person or around VND7.45 million. Similarly, South Korean visitors flying from HCMC to Seoul from now to the end of March can enjoy a discount of 36%, with the price starting from US$288 a person or VND6.13 million, should they purchase tickets at least two weeks before departure. Vietnam welcomed about 65,100 Korean visitors last month, a sharp rise of 122.3% month-on-month, the Vietnam National Administration of Tourism reports. The number of Korean visitors to the country totaled roughly 504,200 in the first eight months of the year, growing 105% over the same period in 2012, according to the tourism authority. Quang Tri Province is renowned for splendid landscapes, interesting local cultures, food as well as friendly residents. The land is also famous for historical relics. Quang Tri lies on the road linking the central region’s world heritage sites, with Phong Nha – Ke Bang National Park world natural heritage site to the north, and Hue’s ancient citadel, the ancient town of Hoi An and My Son Sanctuary as the world cultural heritage sites to the south. Quang Tri also has war-related historical sites which tourists appreciate such as Quang Tri’s ancient citadel, Hien Luong Bridge, Vinh Moc Tunnel and McNamara Line (electric fence) named after former U.S. Secretary of Defense Robert S McNamara who was involved in its creation. The province has a combination of cultures of the central region and ethnic minority groups like Van Kieu and Pa Co and it enjoys well-known events such as the Pa Co buffalo-stabbing festival. In regard to cuisine, the area attracts visitors by local specialties such as seafood of Tung and Viet estuaries, roasted young pigs and Sai Market spring rolls. Lao Bao Border Gate Economic Zone fascinates many tourists who love shopping. The four-star Saigon – Dong Ha Hotel under management of Saigontourist is recommended as the perfect accommodation for tourists in the Quang Tri area. Situated in downtown Dong Ha City by the Hieu River and Dong Ha Bridge, the hotel has 98 rooms, three restaurants, one bar and other facilities such as a conference hall, fitness center and spa. To give customers an interesting experience of a land of spirituality and memories, the hotel is offering many tours to discover Quang Tri such as a two-day-one-night tour of Dong Ha-Khe Sanh-Lao Bao-Vinh Moc, a tour for discovering Con Co Island, and other tours to explore destinations in the central region. Vinh Moc military base is a real highlight. Located about 40 kilometers from Dong Ha City, the site is tunnel-based with three floors underground, the deepest is about 22 meters from the surface. The Saigon – Dong Ha Hotel is located at 1 Bui Thi Xuan Street in Dong Ha City, Quang Tri Province, tel: 053.35777888, fax: 053.3577889, email: sgdh@saigondongahahotel.com, website: http://www.saigondonghahotel.com.